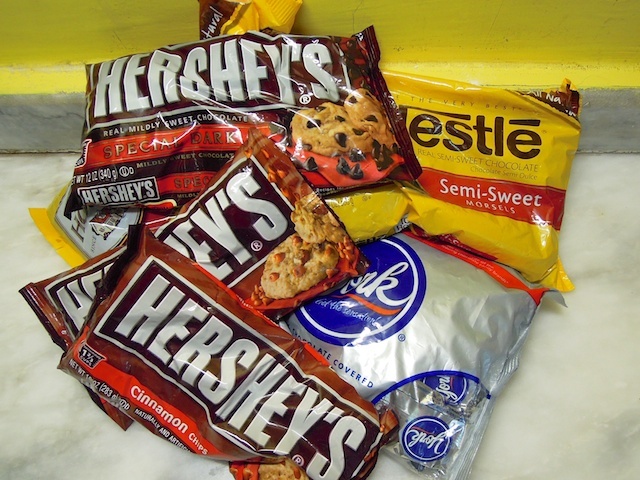 Chocolate chips are not sold in the country where I live as well as the other things pictured above. Somehow I have accumulated quite a stash from gracious friends sending care packages in and from our spring break trip where we stopped at a Hershey's store. They are nice treat to have when it comes to baking but there is always the question of whether I should use them or wait for a better time. Now this question is answered differently depending on the number of bags you have. For example, right now I would definitely make the dessert and not worry about. When I am down to one bag, I find myself analyzing whether we really need the dessert and when can I replenish my supply of chips. Here are a few things I have found in regard to my supply. 1. Always share the treats you make with others. Life is always better when it is shared with others. This is a hard one especially if it is your last bag. 2. Some days just a few chips in pancakes help make the day seem brighter. 3. Use half of what the recipe says. It will still taste good and your chips will last longer. 4. God always provides the chips when we need them. I find it amazing that he cares about such details. 5. When you are down to your last bag, don't be afraid to use it. Chocolate chips are like the finances God provides for us. When we have a lot, we have no problem sharing. When we have not a lot, it gets harder. So here is my corresponding list dealing with finances. 1. Always give to others from what God has given you. Life is better when we are generous. God loves a cheerful giver. This is hard when finances are tight. 2. Some days just giving a little can do a lot. Often it is not how much but the love and thought behind it. 3. I don't need as much stuff as I think I do. I am finding this out more and more as I live in a country where many people barely have just a roof over their head and enough to eat. 4. God always provides what we need in his timing. 5. Sometimes giving is scary but if God says to do it, don't be afraid. Our family is blessed by many who make it possible for our family to live and work here in Central Asia. In turn, my prayer is that our family will bless those who God sends our way. With the blessing comes responsibility. This is something I have thought about many times and I can relate so well! Thanks for sharing your lessons and your chips! I am sure you are a blessing to others around you. Love you, friend.